Builder, Luxury, and Platinum Series whirlpools can be combined with either Airbath II or Airbath III systems for the ultimate bathing experience! A tile flange is used when a wall is built on the deck of a tub, this may be one or more walls. Tile flanges help to create a seal between your walls and tub. Drain location needs to be specified for all tile flanges. 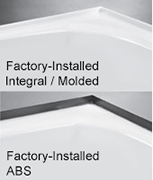 Tile flanges are for drop-in installations, not for undermount installations. The Bel Air 6042 tub is completely customizable. The configuration shown here is just the beginning. Review the list of options to create the tub that is perfect for you. The possibilities are truly endless! Contact us with questions on how to create your ideal bathtub. The Bel Air Tub is made in the USA. Hand-built using the highest quality acrylic materials, the Bel Air features a 20 Year Residential Warranty*. ***When ordering for undermount installation, always advise Americh to assure there are no issues with deck-mounted controls. this is a big comfortable tub. the material is thick and the quality is good. Tub was easy to handle and looks great in my remodeled bathroom. Quality was very good and installation was easy for me and my plumber. I would recommend this product to anybody looking for a quick buy with quality. this is a spacious oval tub of high quality. the whirlpool is powerful and quiet. this is a pretty standard tub size and design but Americh warrantees their product for 25 years! the acrylic is durable and the material is thick.